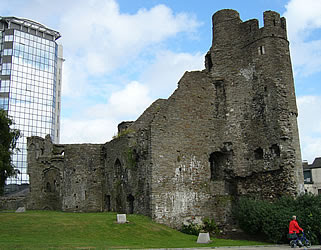 Since becoming Lord of Glamorgan in 1317, Hugh Despenser had managed to take neighbouring Gwynllwg from his brother-in-law Hugh Audley, harassed his other brother-in-law, Damory, (unsuccessfully) over his lands and had become the king’s chamberlain, gradually worming his way into Edward’s affections, garnering royal grants and favours along the way. In summary, his star was very much rising in inverse proportion to his plummeting popularity amongst his peers (and that’s probably understating it). In the year 1320, a rather peculiar event occurred – which managed to turn itself into a full-blown crisis – all over a small part of Wales known as Gower. Gower was part of the lands of the last of the line of what had once been a powerful and important Marcher family – the de Braoses. The current de Braose, William (one of many William de Braoses), was born in about 1261 and gained his inheritance in 1291. By this time the family was deep in debt due to a series of expensive lawsuits (mostly brought by other members of his more-than-normal dysfunctional family) and he was a very unpopular landlord. In 1306, his tenants in Gower even deserted their lands and went to seek justice from the king for their lord’s misdeeds. William married, firstly, Agnes (family name unknown) and by her had a son (another William, wouldn’t you just know it!) and two daughters. The eldest daughter, Joan, married James de Bohun of Midhurst and the other daughter, Alina, married William’s ward, John de Mowbray (they were betrothed when she was six and he was 10). William also married Elizabeth de Sully in 1317, but the union was childless. In 1320 tragedy struck the family when de Braose’s son and heir died, and de Braose found himself not only lacking in a direct heir of his line, but also very deep in debt. As de Bohun had died in 1306, the inheritance of his estates now fell to Alina and de Mowbray. 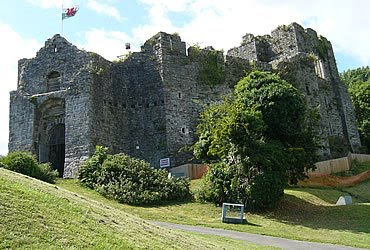 Gower, although small, had several strategically important castles and, of course, a port at Swansea with the potential for lucrative trade. As it stood, he held the land under from the king for a knight’s fee, and at his death, his daughter would inherit it from him. However, de Braose, desperate for money, decided on a desperate ploy – although how he ever thought it would work, heaven knows. He decided to put the reversion of Gower (after Alina’s death) on the market, and it immediately attracted attention from other Marcher barons – especially from the earl of Hereford, both Roger de Mortimers, and, of course, Hugh Despenser the younger, upon whose border Gower lay. However, instead of selling to one of them, de Braose seems to have acted rather strangely and unwisely. He accepted offers from all of them and even took a deposit from Hereford. He then sold the lands to his son in law, a move which was bound to aggravate all parties, especially Hereford. But the man most aggrieved turned out to be Despenser, who naturally saw Gower as a valuable addition to his ever-growing lands in south Wales. Mowbray, knowing Despenser’s reputation for forcible entry into lands he coveted (such as Gwynllwg), decided to pre-empt him and get there first. Technically, the alienation of land held from the king without his permission could result in the forfeiture of that land – certainly in England. However, the marches had their own peculiar customs and rights dating back to the conquest of Wales, including that new land could be entered into prior to the royal licence being granted, as long as a fine was paid at chancery. Once the fine had been produced, it was extremely unlikely that the ruling monarch would then refuse the claim. This custom probably dated from a time when Anglo-Welsh politics was particularly unstable – during the Welsh wars which ended with Llywelyn ap Gruffydd’s death in 1282. Now, even though the Welsh couldn’t exactly be thought of as ‘tamed’, things had settled down a lot and it must have seemed to those without land in the marches that these men now had access to exclusive privileges without having to do much to earn them. contempt, and that the escheators beyond Trent, concealing such alienations, have applied no remedy thereto as pertained to their office, whereat the king is much disturbed. It is not hard to imagine the mind and hand of Hugh Despenser behind this move as no other commission was ordered into any other marcher family. This seemed particularly aimed, and timed, to put into place a ‘test case’ whereby customary marcher privileges could be questioned. This would have conveniently set Gower up for confiscation into royal hands and then to be finally granted, presumably, to Hugh. If so, it was a clever scheme, using the legal process, something which Hugh excelled in (even if it was to bend the rules so much they practically broke!). John opposed this, the earl of Hereford also opposed it, pointing out the general disadvantage, humbly begging the lord king not to introduce a new law, rather than [keep] customs used and approved from time out of mind. Hugh Despenser stubbornly insisted, saying that the lord king had always enjoyed this prerogative in Wales as in England, that no one without the king’s licence should have entry upon any fee held of the king in chief; and if, on the other hand, this should be attempted by anyone, the fee so seized should be assigned to the royal treasury. Others cited the law and customs of the March which could not be infringed. Hugh took no notice of the customs and law of the March, and appeared to accuse the barons who cited such things of treason. On 13th November, Edward decided to try again, sending the escheator himself, Richard de Rodeneye, this time with more royal troops, to capture Gower. On November the 20th, he issued a commission of oyer and terminer to Hugh Despenser the elder, Bartholomew de Badlesmere, John de Stonore and Robert de Malblethorpe to ride throughout Glamorgan, Gower, Kidwelly, Brecon and Iskenny and find out (and, I suppose, detain) the troublemakers who had dared to resist the king’s writ. 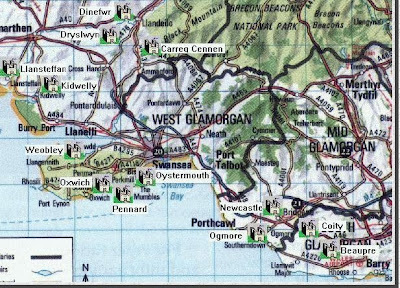 By December 28th, it seems that all resistance had been overcome, for on this date William de Caveresham was appointed as the steward of the land of Gower, answering to the king and the exchequer for the issues from it. His wages were to be ordained by Hugh the elder and Bartholomew de Badlesmere. To the marcher barons it must have seen like a right little royalist conspiracy against them and their rights. And the person they blamed the most for instigating it was Hugh Despenser the younger. Greedy for land and power, with a hold over Edward that seemed absolute and against their interests, Despenser probably made Gaveston look like a mere irritation. Their enemy was ruthless, extremely clever and politically astute and, for the moment at least, practically untouchable. But now, as before with opposition to Edward’s other favourites, a coalition was beginning to form, one that was so powerful and implacable that it threatened to bring England and Wales to the verge of civil war. Tagged de Braose, Gower, Hugh Despenser the younger, Humphrey de Bohun, John de Mowbray, Marcher Lords, marcher privileges. Bookmark the permalink. Have any of you read The Mowbray Legacy (NF) by Marilyn Roberts? I think it deals in part with this incident. Gabriele: Braose was certainly culpable but I don’t think he’d really thought it through. He appears to have been a rather weak and desperate character – just the sort Despenser preyed upon. And… So you have those typo demons too? Mine have been getnig oot of hend letaly. See?